Breakfast is the most important meal of the day. We know this phrase is used a lot, but it’s true! We love breakfast here in Spain, including, if we can, a second breakfast. What would become of our day without the mid-morning breakfast? It’s all about gathering energy. And above all, the traditional Spanish breakfasts are the best. More and more imported products are becoming popular breakfast food; however, there are still many traditional Spanish breakfasts that continue to be adored, and not only by the Spanish. Historically, the traditional Spanish breakfasts have played a fundamental role in the country’s cuisine. In this article, we’ll show you some of the best traditional Spanish breakfast foods that you must try. The origin of Sabao Pasiego can be found in the Cantabrian Valles Pasiegos. This is one of the most well-known traditional Spanish breakfasts in Spain, but there is nothing like the original made in Cantabria. This product with I.G.P. is made with sugar, flour, and butter. Although its exact origin is unknown, its renown has grown thanks to the raw ingredients with which it is made that come from Cantabria. The tradition of eating sobaos pasiegos for breakfast goes back more than 100 years, and it is common to dip it in your milk or coffee. If you’re looking for a store where you can buy products typical of the area, we suggest Casa El Macho, which is famous for its sobaos. They also have other traditional Cantabrian products. 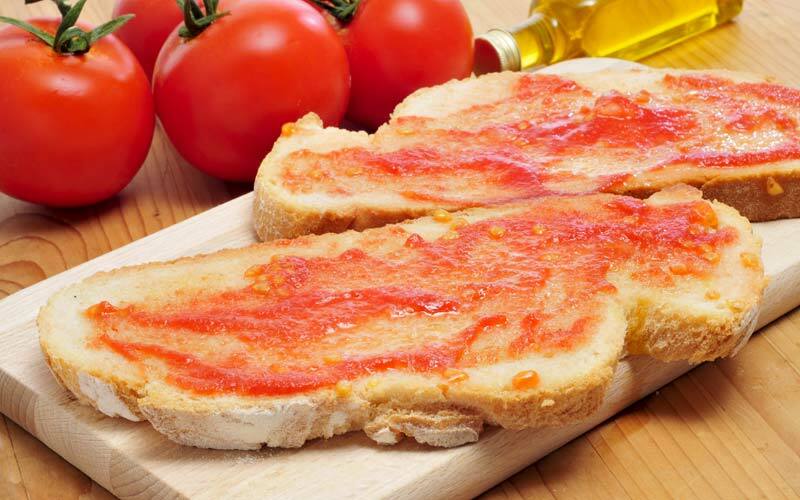 Although it is now commonly called “pan tumaca,” its name was originally the Catalán “pa amb tomàquet,” or “pan con tomate (bread with tomato).” Whether you’re at home or in a bar, there is nothing like a piece of toast slathered with tomato (pulpy or smooth) with a little bit of olive oil and salt. Typical of Cataluña, it is also similar to Valencian and Andalusian food. 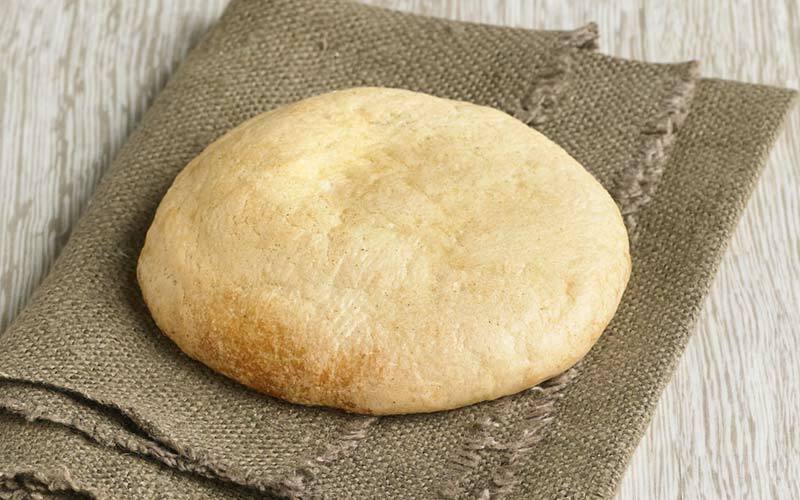 When we are talking about a Mediterranean diet, the pan tumaca always comes up. For more than 100 years, La Bodegueta has been a prime destination for eating pan tumaca in Barcelona. This place is perfect for eating breakfast and enjoying the Catalan product. 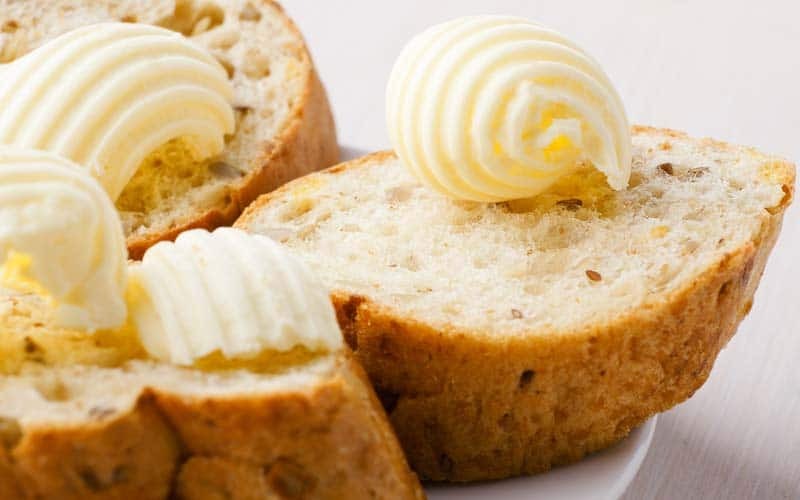 There is nothing more simple, but at the same time, more rich as bread and butter. 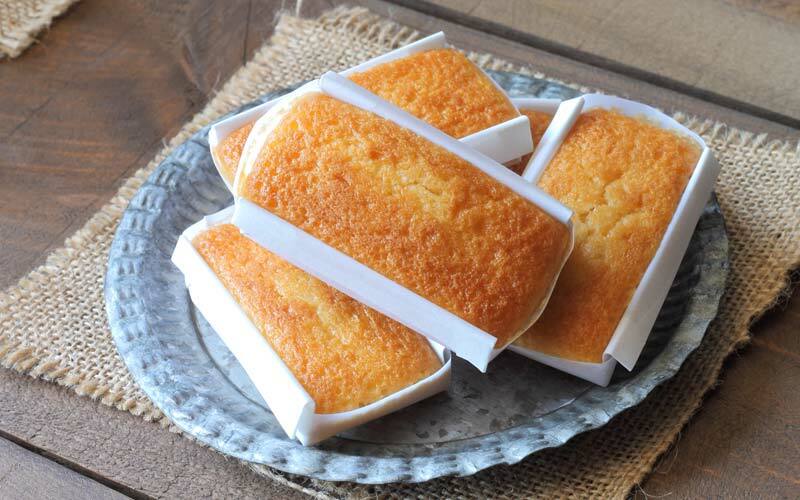 In Castilla and León, and especially in Soria, we find the three types of butter: natural, salted, and sweet. These all have a D.O. in this region. This is one of the traditional Spanish breakfasts that you have to try. 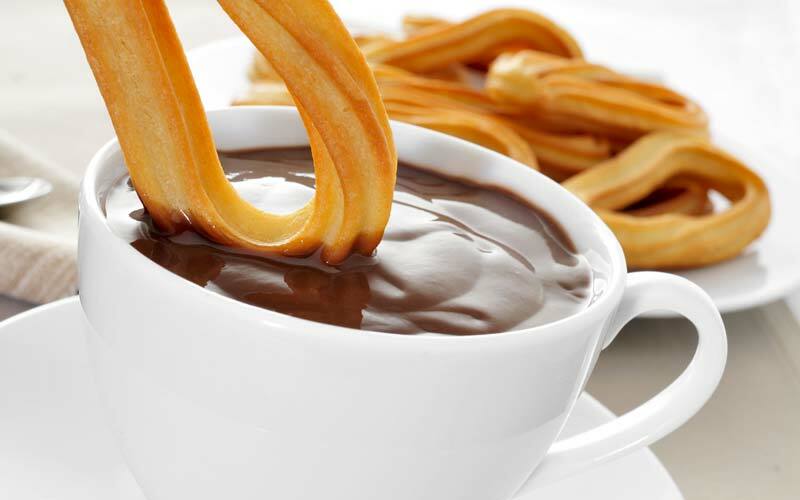 Churros with chocolate is another one of the traditional Spanish breakfasts that you can find in any Spanish city or village, but we recommend those in Madrid. Churros with hot chocolate is a very common breakfast during the winter because of the cold temperatures. People in Madrid have been eating churros for breakfast since the beginning of the 19th century, and it is believed that word of this habit spread by means of the itinerant fairs that came to the capital. Its popularity can surely be attributed to its low cost. At the time, they were also known as “fruit of the frying pan,” since they are made by frying the dough in boiling oil. This is one of the traditional Spanish breakfasts that is common in Andalusia and Extremadura. Colorá butter is a lard of pork and paprika that is usually spread on bread for breakfast. In Andalusia, it is usually eaten with a piece of lightly-toasted mollete (bread muffin). It is also common to eat mollete with ham. The most famous molletes come from Archidona and Antequera in Málaga. Ensaimada from Mallorca is one of the sweetest traditional Spanish breakfasts, and it is also the perfect kind of cake to eat as a dessert or a snack. In the 17th century, Mallorcan ensaimadas were always made for festivals and celebrations. There are two types of ensaimadas covered under the I.G.P Ensaimada de Mallorca: those without filling and those stuffed with cabello de ángel (a type of jam). You can also find ensaimadas with whipped cream, cream, and chocolate. If you can try the best ensaimada, then there is no competition. 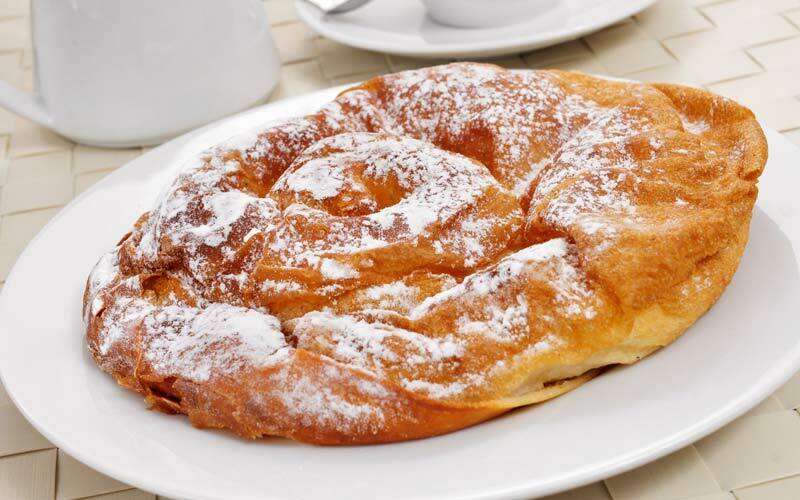 The Forn i Patisseria Gelabert, in Mallorca, has received the title of having the “best ensaimada in the world” for 2018. The Fartón (fartó in Valencian) is one of the most well-known traditional Spanish breakfasts in Valencia, and more traditionally in the municipality of Alboraya. These are long, soft, sweet buns that are meant to be dipped in horchata or coffee. 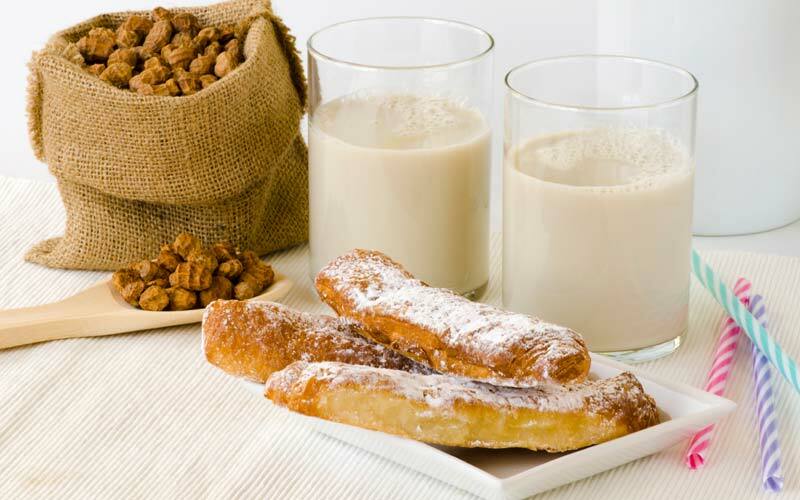 The origin of the fartón is linked to horchata. According to legend, Jaime I baptized horchata as “pure gold.” From this moment on, the horchateros of Alboraya looked for a sweet to go with this drink. They found what they were looking for in fartóns. The gofio is a very old and very typical food of the Canary Islands. Although it is not as popular on the mainland, it is one of the favorite traditional Spanish breakfasts of the Canary Islands. 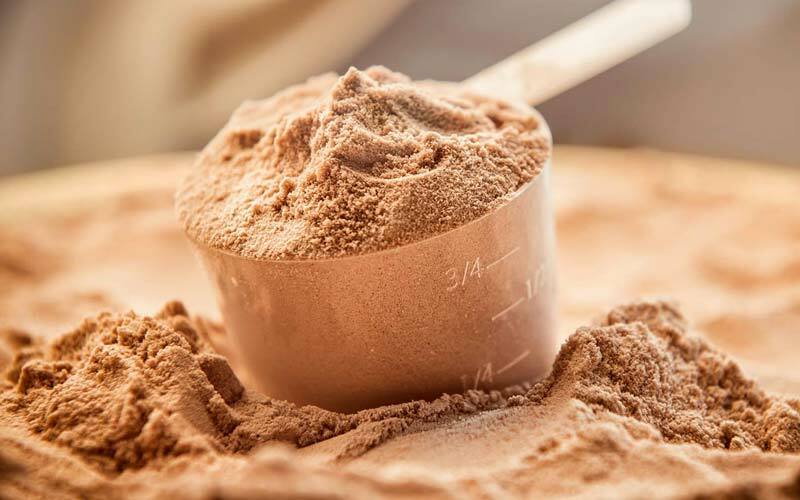 It is made from a toasted cereal flour that is high in calories, so we recommend eating it with milk for breakfast so you can have that energy for the rest of the day. There’s room on this list for some more traditional Spanish breakfasts! Do you want us to add another traditional regional breakfast? Tell us which one if your favorite in the comments below!